Beautiful luxury home in Trafalgar Village, Kissimmee Florida. The home features 4 bedrooms. The king size bedroom has a master bath with a Jacuzzi tub and large shower. There is a queen bedroom and two bedrooms with two twin beds in each room. Cable TV in all bedrooms with a large screen TV in living room with VCR / DVD. There is a private patio which is screened in with a private heated pool and spa. The patio has seating for outside dining and for as well as lounge chairs. There is also a gas BBQ. The home has an open floor plan so it has a very relaxed feel. The dining room seats 6. The counter area can seat 4. There is a laundry room with washer and dryer. This gated community offers a true resort style clubhouse with a movie theater, game room with pool tables. There is a large pool and patio overlooking a private man made beach. There is a volleyball set up on the beach. You can walk around the lakes and private wooded setting. All of this and so close to Disney and other attractions. Golf Details: There are Three signature Golf courses in the area (Palmer,Nicklaus and Watson) and the Annika Sorenstam Golf Academy. Additional Information : Because we want to provide everyone with a great experience at our home please adhere to the rules of no smoking and no pets. Some of our family members and guests are allergic to both smoking and pets. There will be an extra charge of $500.00 to clean the home if the rule is not followed. So please make it a pleasant experience for everyone. There is a $10.00 per day charge for pool/spa heat. This will be billed separately if not included in the original quote. Deposit requirement: A non refundable two hundred fifty dollar deposit is required to secure the booking. Balance is due 8 weeks before arrival, together with a $250.00 refundable breakage fee. Breakage fee deposit will be returned within 7 days of departure. We purchased our home after coming to the Disney area for years. We loved bringing our children to the area when they were very young right through their teenage years. Now we look forward to someday having grandchildren enjoy the same experiences. We always wanted a vacation home that was close to the parks but far enough away from all the hustle and bustle. Our community fit the bill with all of the wonderful amenities available to us. The home is close to wonderful golf courses as well as downtown Kissimmee. You can come home after a busy day out and enjoy your own screened in pool and spa. Sit around with family and friends and have a BBQ cooked meal. The master bath is a very large bathroom featuring a Jacuzzi tub and oversize shower. There is a double sink in the master bath. There are plenty of towels and linens provided in the home. Since our home is a corner home you have the availability to park in front of the home on the street or use the driveway in the rear of the home. Have a relaxing time sitting around our comfortable living room. Spend the time watching a movie on the large screen television. Large kitchen with everything you need to have a home cooked meal if you don't feel like eating out all the time. There are plenty of places to enjoy sitting and having a meal. You could sit at the island counter (a favorite spot for kids) or enjoy sitting around our dining room table. Our home has a well manicured and landscaped design. Step out from the master bedroom right onto the patio and enjoy your time relaxing or going right into the pool or hot tub. There are championship courses all round the area. Our home features a screened in private pool with an attached hot tub. It is a walkout from multiple doors as well as an outside entrance to one of the bathrooms. There is a patio with lounge chairs. There is a large pool with plenty of lounge chairs and a beautiful area in the clubhouse. Nice private hot tub attached to the pool. Our beautiful home is here for your enjoyment. 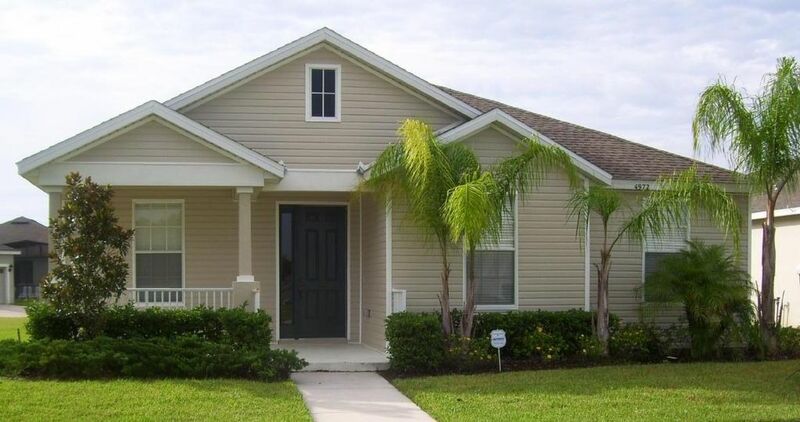 It is a fully air conditioned home located in the beautiful premiere resort of Trafalgar Village, Kissimmee, Florida. This is a new upscale gated community which is surrounded by luscious woodland and lakes. You will be minutes away from all of the excitement that the Orlando area has to offer. Our home is maintained to high standards so that you can enjoy your vacation worry free. There is close by shopping so you can get the supplies you need to enjoy your stay. There is a wonderful Target Store in the area which features a full supermarket inside. All of the appliances are in brand new condition. There is a washer / dryer, and dishwasher. The kitchen it has all the appliances that you will need to take care of your family and friends. There is no need to pack your hair dryer it is provided for you. Come and enjoy this beautiful upscale community, I am sure you and your family will create great memories. Our family really enjoyed our stay and Kevin was great communicating with us and answering any questions. We would recommend this home and will stay here again ourselves. Thank you for your kind review. We really try to accommodate our guests and make them feel welcome at our home. We would love to have you come stay again. Once again thank you. Great place to stay when visiting Orlando. When we walked into the house we felt right at home. Everything looked like the pictures had shown. It was clean and tastefully decorated. We spent almost all our time in the hot tub and pool. Even though it was a little chilly outside, the hot tub was nice a toasty. The owner and the manager were extremely easy to contact and helpful with our questions. We had a few minor issues, but they were quickly taken care of. Another couple came with us and we decided we would try to rent again next year. This was our first time to rent a house with VRBO and will do again. The home was suited for our sleeping needs and plenty of room in the living area to gather for cards & watching the Rose Bowl Game - Go BUCKS !! Our grandchildren enjoyed the pool at the home and at the Clubhouse which this home is just a short walk from.. The gentleman at the Clubhouse was very gracious in showing us around. They had a fireworks display on New Years Eve. The neighborhood was very quite. There was an issue with the TV which the property manager & owner took care of as soon as possible. The rental price was very reasonable compared to other homes of this size. If we ever return to this area we will definitely check to see if this home is available. Thank you so much for such a nice review. We really try to make our guests feel welcome in our home. I’m sorry about the cable company, they definitely underperformd as far as I am concerned. Would love to have you back. Great owner and lovely and clean place. We rentet this house, and we have rentet alot of houses in this area. But this house and its owner, gave us the best vacation ever! The house have plenty of room, the pool area is great. We couldnt find out how to use the pool heater, after we contacted the owner, the poolguy came the day after. Awesome service. The beds are good and the house is very clean. It will fulfill all your needs.Great and safe community, I would recomend that you to strongly consider this home for your next vacation. Thank You so much for such a nice review. We try very hard to make our guests have a great and worry free vacation. We hope you come and stay with us again. Our family of 5 had a great Spring break while staying at this house. We enjoyed the pool and spa immensely. The house was very clean and in very good shape. We had no issues. The community was safe and had a nice club house pool. We would definitely stay here again. Good, but could have been better! Loved the house, however, there was a few things that could have been improved. One, we were not informed of a change in the alarm codes and therefore, the alarm would not stop and we had to call New York to get the correct codes. Two, the TV and internet did not work and repairs had to be done over the first two days of our visit. Three, the barbeque was old and very rusted, possibly, unsafe. Four, the sliding doors to the pool, did not work correctly and had to be repair twice. Even though we enjoyed our stay, the were small anoyences which could have been avoided with an inspection prior to our arrival. Golf: There are Three signature Golf courses in the area (Palmer,Nicklaus and Watson) and the Annika Sorenstam Golf Academy.